For police, fire and other emergency management personnel, IT and communications systems need to work fast, be interoperable and free of IT friction. The most urgent IT needs facing public safety officials today include streamlining data access, increasing productivity of the workforce and improving access and connectivity for first responders, according to state and local officials in a new report. Produced by StateScoop and underwritten by VMware, the report profiles three public safety officials and shares how their agencies in California, Florida and Houston are addressing these needs. Facilitating access to databases, communications systems and emergency management channels has increased workers’ productivity, according to Carla Simmons, chief information officer for California’s Office of Emergency Services. Simmons says that efforts in California to deploy next-generation incident command system software, dubbed SCOUT, is enabling fire officials and other emergency management workers to exchange information and intelligence as they respond to emergencies. Connectivity and access to information and applications in the cloud present a special set of challenges. The report stresses the need to reduce the complexity of IT for local and state agencies. However, when agency IT departments are able to increase connectivity, there is tangible potential for improvement in productivity. Houston’s police department has worked to improve integration of its radio systems, records management and offense reporting systems, says Slinkard. Officers patrolling Houston, for instance, can now access the department’s cloud-based records management system virtually and securely. Just a few years ago, “before cloud environments, before data migration and data warehousing,” officers lacked the information at their fingertips to respond in real time, Slinkard shares. For Richard Butgereit, CIO of Florida’s Division of Emergency Management, technology has become an essential piece of public safety, emergency management and disaster response toolkits. Since the 2017 storm season, Florida has made strides to upgrade its virtual server environment, upgrade network interface speeds, improve backup and restore capabilities and build strategies to spread consumption across its infrastructure. “Emergency managers often work in degraded environments,” says Butgereit, making it crucial to support disconnected workflows. 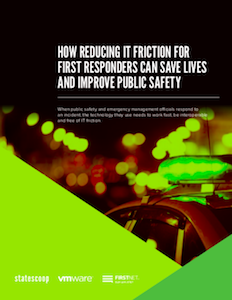 IT executives at public safety agencies like those in California, Florida and Houston are focusing more than ever on finding ways to reduce IT friction and help their workers get more fluid access to valued information and tools to serve the public in times of need. Download the eBook about improving IT connectivity across state and local departments and agencies. This article was produced by StateScoop for, and underwritten by, VMware.